Syllabus of the Online Course (Subject): Regional Cooperation Council (RCC) - South-East Europe Atlantic. 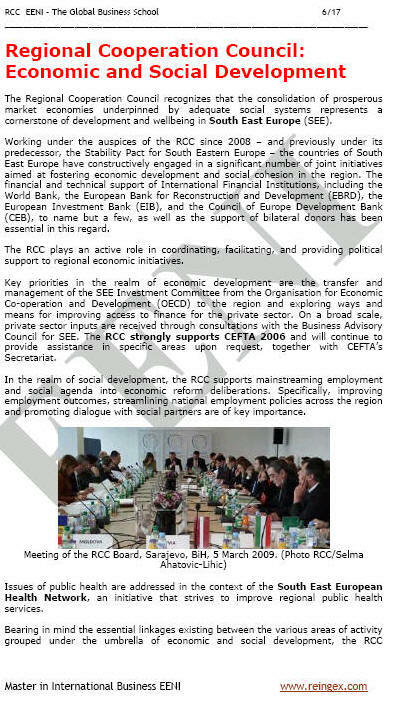 Introduction to the Regional Cooperation Council (RCC). The Regional Cooperation Council is the successor of the Stability Pact for South-Eastern Europe. The Regional Cooperation Council focuses on regional cooperation promotion and enhancement in South-east Europe and encourage the European and Euro-Atlantic economic integration and international trade. The Regional Cooperation Council (RCC) identifies that the consolidation of successful market economies supported by the social systems represents a Barriers for the South-east Europe development.